Billy was great to work with! E-mail, phone, texting, it didn't matter what means of communication I had at the time. Billy set up the payment exactly the way that I needed it. 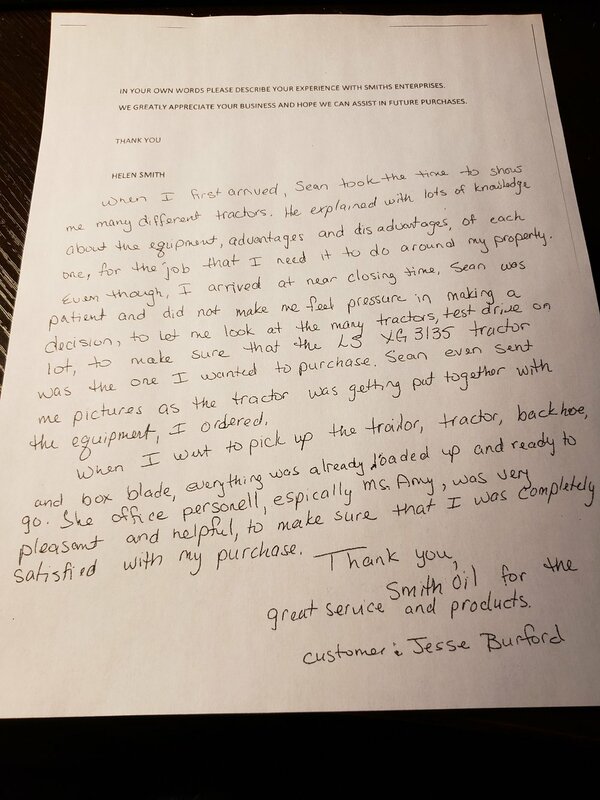 I paid a down-payment to cover the freight cost of the tractor for his driver, then handed off the cashier's check for the remainder to the driver once he'd delivered the tractor and I had an opportunity to inspect it. If the mark of a good deal, is that everyone is happy when it's done, then this was certainly a good deal. Haywood (driver) was great to work with too. He spent time going through the controls of the HST and described the auto mode of the PTO. I put the tractor to work that day, and it did excellent work. The 8" chipper made short work out of tree branches and poplar tops. Great tractor, Great experience! I just purchased a 40hp Ls tractor from them and trailer, they were a pleasure to deal with, very professional and excellent prices and delivered to my door 10hrs away, highly recommend. This is the best place to buy a car. Over the past 9 years we have got three cars from them and we still have all three. Just letting you know that my Epic was successfully packed and ready for taking long trip to Uzbekistan. Thanks for everything, you and your office staff have been very helpful during the purchase . I could not expect more from any company you made every effort to make this a smooth transaction for me and to make sure I was comfortable with the deal. I can honestly recommend you to anyone for a honest deal. I hope this is not the last boat I am buying from you. Billy has been an absolute pleasure to work with. The first time I called him about possibly buying an 09' Epic from him, he spent 45 minutes with me, just going over some of the features. He was very straight forward, and honest. Everything he said he would do, got done. When I finally decided to buy it, Billy said I would have it by the weekend. Well even though my bank made me and him jump through a bunch of hoops, he made it happen. He also has e-mailed or called me through every step of the process. No wonder why you are one of TYM's top dealers... always a pleasure doing business with you. I just wanted to say Thank you for getting my tractor, finish mower and tiller here this past weekend! As always you go above and beyond! Also the melons and sweet potatoes are great! It is a pleasure doing business with you! Fred said he emailed many tractor dealers and Smith's was quick to Call him with a DEAL. He said many other dealers did not respond or just emailed back. He is very pleased with his tractor and service from Smith's. I heard about Smith's on the internet, I was treated GREAT during the sale, I would recommend Smith's to others . It was a painless experience with a GREAT STAFF and a GREAT PRODUCT at the Best price Available. I would like to say that it was a pleasure to do business with you. The LS R3039H is an excellent machine and I am very satisfied. Delivery arrived on time and the guys were professional. Your a business that I would recommend to others in the market for a new machine. Just had to let you know about the TYM. I changed the bracket on my Quick Attach skidsteer brush cutter, put it on the t503 FEL and ran hydraulic lines from the rear remote, to run it. How sweet it is. I can clear stream (canal) banks with ease. I can see to get around trees and tilt for any angle. All from a dust & debris free cab. Perfect for an old man, like me. I can’t tell you what a great time I have been having with the Jinma 284 you sold me, in March 2007! I continue to be pleased with the tractor. It’s getting a little beat up now but that’s all cosmetic. Runs like new! Hope you, your family, and the whole team have a great new year holiday! Stay safe! 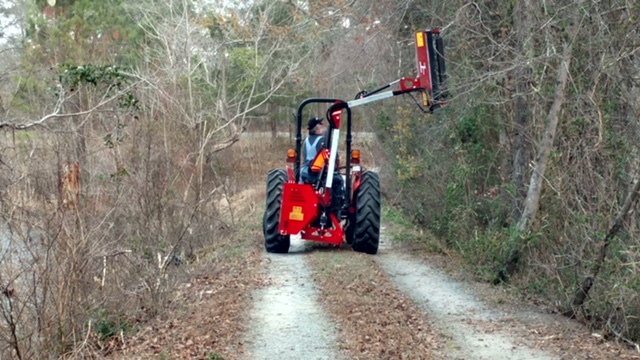 I’ll share more videos of the tractor in action soon. Working the new cutter bar. Further the down the lane. To begin I would like to thank you for getting my tractor to me a week earlier than anticipated. Your driver ( you will need to check your records, I can't remember his name) is very knowledgeable of the product and your company. He was courteous to my family and and seemed to enjoy helping us with our new purchase. Now, as for the tractor. Billy listened to may plans for a tractor and put me with a TYM 394 with loader. I could not be any happier. With a little over 10 hrs. in 4 days, 9 mowing and 1 playing, so far this thing is awesome. This tractor has amazing power and the power steering is unbelievable even with a fully loaded bucket. The 394 is comfortable with easy access to features, controls stay true to settings. My neighbors said it was cute, but they don't know the BEAST that lies inside. I look forward to future purchases with Smith Ent. I chose Smith's because of their rock-bottom pricing, but if you're comparing this dealer to the other low-cost sellers of tractor packages, pay attention to the reviews! These guys are rated highly, and it's for good reason. After closing on a new property, I reached out to Smith's Enterprise on Saturday, asking whether I could pick up a (financed) tractor package the following Monday morning - yes, less than 48 hours later. Everyone at Smith's absolutely bent over backwards to make this happen for me, even though I was asking for the moon. The tractor is pristine and factory-fresh, and the friendly folks at Smith's loaded and secured everything onto the trailer for me while the paperwork was being drawn up. Even though I had a compressed timeline (so there was no time to have things prepared ahead), the whole process took less than three hours. And as icing on the cake, I realized when I arrived that I have forgotten my tow ball back home in Ohio, so the salesperson *gave* me the one off of his own truck to save me a drive back into town to buy another one. I just bought the tractor so I will let you know about that later, but Tony was terrific to work with. He worked hard to make sure I was happy with my purchases. The staff were nice and friendly. They were helpful with the paperwork and trying to help me save even a couple dollars, which is always a good thing. I would definitely recommend doing business with them. This is by far one of the BEST buying experiences I have had. Billy is as honest as they come and will work hard to make sure you are 100% satisfied. You will not find lower prices or better service any where.